Use IL. Route 47 North when coming from the south. Use U. S. Route 24 East when coming from the west. Use U. S. Route 24 West when coming from the east. At the intersection of U. S. Route 24 and IL. Route 47 in Forrest, IL, take IL. Route 47 north for about a mile. Just as you exit the town of Forrest on the north edge, look for county road number 900 North / Church St. Turn right (east), travel about 1/4th of a mile. The church is on the left (north) side of the road. Use IL. Route 47 South (from Dwight, IL) when coming from the north. 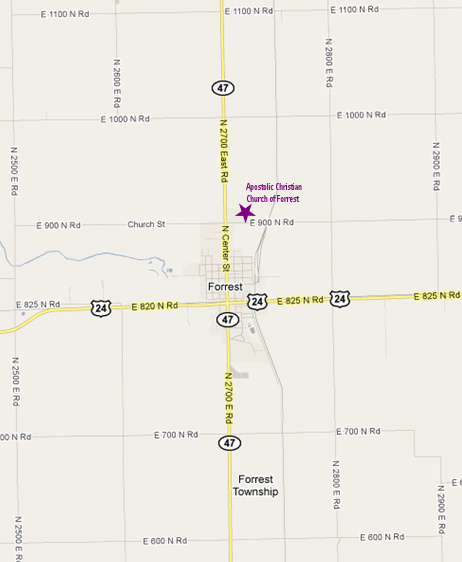 As you arrive to the town of Forrest on the north edge, look for county road number 900 North / Church St. Turn left (east), travel about 1/4th of a mile. The church is on the left (north) side of the road. Most online maps don't have 201 E. Church Street yet. See map below for details, click on map to see larger version in new window. Copyright © 2010 - 2019 Apostolic Christian Church of Forrest. All rights reserved.